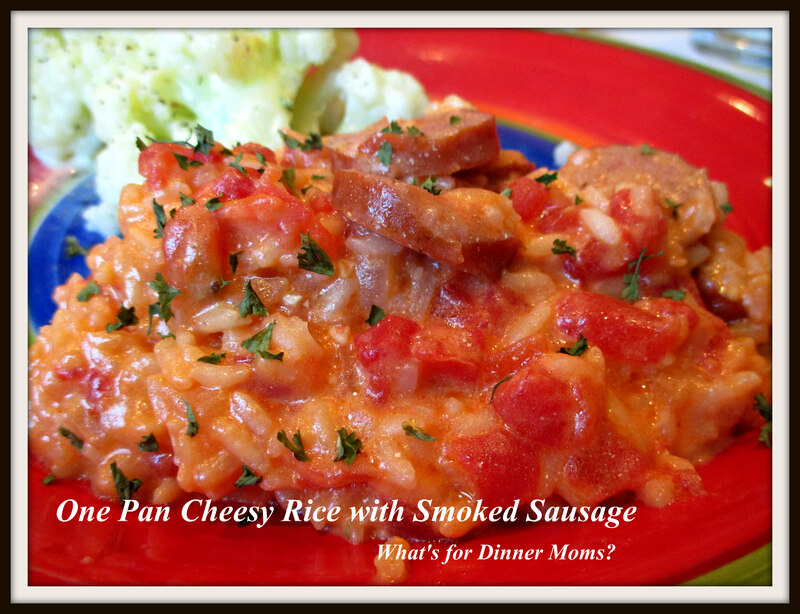 One Pan Cheesy Rice and Smoked Sausage – What's for Dinner Moms? As I watch other families post pictures about the first day of school I am so happy we still have 34 days of summer vacation left! I love fall and back to school time but I also love having my kids around all summer. We still have cello camp, dance camp, a Feis in Milwaukee, a trip to Rochester for Mama and many beach days left to enjoy. I am still all about easy meals even during the summer. I want to be able to come home from the beach and have dinner ready in under 30 minutes. That means slow cooker meals, grilling and one pan meals are at the top of my list of go to meals. This recipe was a take off from a smoked sausage meal with noodles. We had pasta several times over the last few weeks so I decided to switch things up with rice and create this dish. My rice hating daughter was not thrilled with the dish but she picked out the sausage and didn’t complain too much. Everyone else though it had good flavor and asked for second servings. There was enough leftover for one lunch serving the next day. I served this dish with steamed broccoli and cauliflower, with a plate of cut vegetables as sides. In a large skillet over medium-high heat add the canola oil, sausage and onion to the pan. Cook, stirring frequently until the onion softens and the sausage is slightly browning. Lower heat to medium-low and add cream cheese, tomatoes, chicken stock and a dash of salt and pepper to the pan. Stir until cream cheese melts completely. Stir in rice and half and half. Bring to a slow simmer and cover pan. Let simmer on medium-low to low heat for 20 minutes. Stir once or twice while cooking rice to avoid any from sticking to the bottom of the pan. Once rice is cooked add cheddar jack cheese and stir well. Taste and add salt and pepper as needed. Serve warm garnished with extra cheese and parsley if desired.